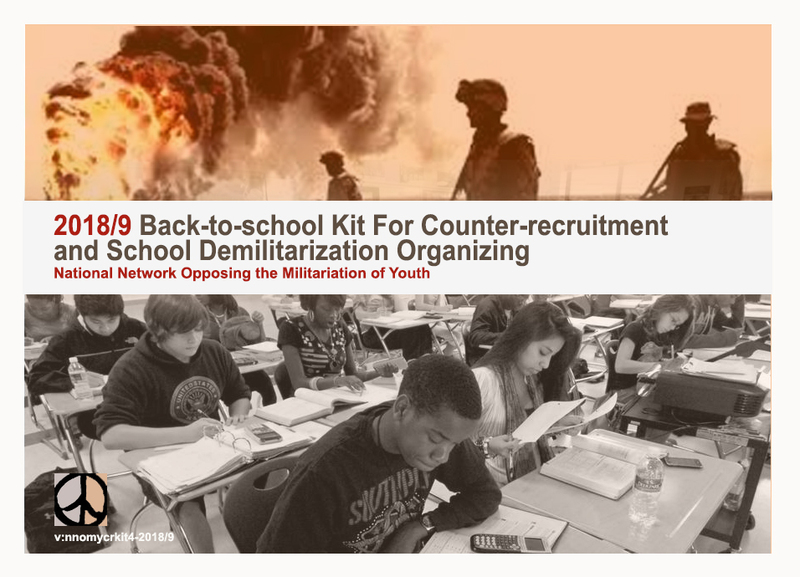 The Back-to-school Kit for Counter-recruitment and School Demilitarization Organizing is a catalog of basic material useful to educating young people and school personnel about the realities of military enistment and war. The catalog also includes some information on alternatives to enlistment, as well as items written for organizers seeking to reach out to local schools. All of the material in this catalog was carefully reviewed for relevancy and accuracy as of the Spring of 2018. A task force of knowledgeable organizers did the research. It does not include all of the available literature on this topic because much of what exists is out of date or is no longer bing produced by the original sources. Consequently, we focused on identifying items that we felt were basic and most useful for effective organizing and educating. New items may be added to future kits as they become available. It’s very simple: Read the descriptions in the catalog and then go to the links that are listed to view or download documents that are relevant o your local organizing. In some cases, you will be able to reprint them for local reproduction; or, you will be able to order copies in bulk if they are offered by the original source. NOTE: If you wish to print the catalog, be sure to choose the landscape setting in your print menu (i.e., horizontal).